I’m assuming if you read this blog, you probably read other blogs, whether cooking, design, fashion, living, music.. anything really. I follow heaps. Like a ridiculous amount. My morning and evening ritual usually requires opening Bloglovin and catching up on new posts. I follow a crap load of blogs, a lot of food, but mainly fashion. Right now, I have been following New York and London fashion week. I get obsessed. I watch Garance Dore’s videos like they are the current news. I read Man Repeller everyday without fail. My other half has never seen this side of me, and I don’t think he knows how utter obsessed I am with the industry. I read these blogs and feel like I know these writers personally. In a way, I feel like I’m there, at fashion week, only to soon realise that I’m stuck in little ol’ Perth where fashion in, well, how do I put it… I think I won’t comment. But reading these blogs, it makes me feel like I have these ‘friends’ all around the world. I don’t know if it’s sad, or it’s this ‘blogging community’ people always talk about. And the thing is, I don’t even care if they know me or not, it’s not even about that. It’s the feeling that I’m putting something out there that people seem to like. That’s a nice feeling. So it pains me when it takes 4 weeks to put up a new post! But sometimes that happens. My laptop has been processing oh so slow, and the thought on having to use photoshop on it almost gives me a headache. But enough of that gibberish story telling. I give you an amazing winter dish that I made just before the weather started turning to spring. I ate a similar dish at a local restaurant, West End Deli, on a freezing cold day, and it did everything to warm me up. I took the idea of braised oxtail and gnocchi and came up with this baby. 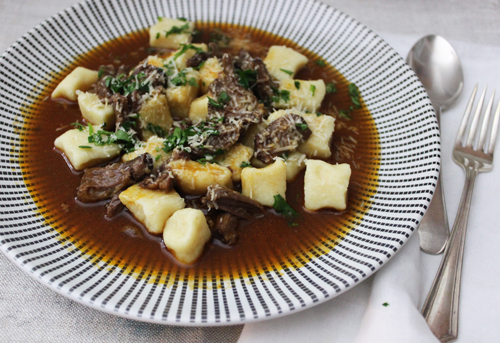 The oxtail is rich and velvety, and the gnocchi a great starch to accompaniment to the sauce. Heat a good slug of olive oil in a heavy based pot. Add the oxtail in batches (or as many as can fit in the pot, all touching the base) and brown slightly for a couple of minutes either side. Remove from the pot and set aside. Add a little more olive oil to the pot, then add the onion, carrot and celery and cook for 5 minutes or until onion is slightly translucent and other veges have some colour. Add the garlic and continue cooking for a few more minutes. Add the tomato paste a stir well. Place the oxtail back into the pot, add the red wine, beef stock and thyme. Add a good pinch of sea salt, and give it a good stir. Cut a piece of baking paper into a circle the size of the pot and make a little hole in the centre. Place on top of the stew so it’s touching. Place the lid on top and leave it on a gentle simmer for 2 hours. When the sauce is nice and thick, turn the heat off and let it cool slightly. Take the oxtail out and pick out the meat (although messy, your hands are the best way of doing this). Place the meat in a separate bowl and discard the bones and extra fat. Strain the sauce in a fine sieve, so you have a nice rich, thick sauce yet. 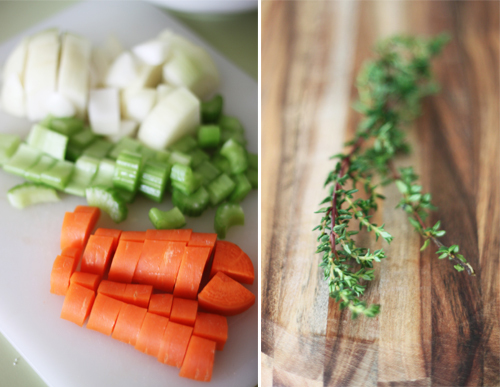 Push on the oinion, carrot, celery and garlic so you get all the juices out. Discard the rest. Place the sauce back into the pot, and add the meat. You can put this in the fridge if serving the next day, or set aside until your ready to serve. Taste and add salt is needed. 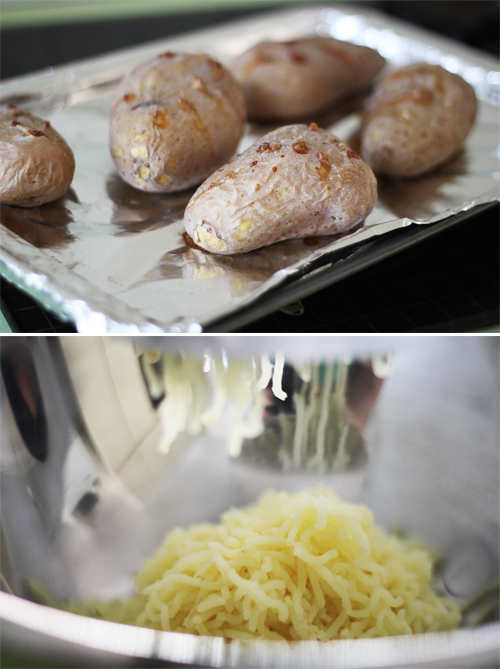 Place the potatoes (with skin on) on a tray, prick with a skewer, and bake in an oven at 200C for 1 hour, or until cooked in the centre (test with a skewer). Remove and set aside to cool. In a large bowl, either mash the potatoes (remove the skin first) or use a ricer, which will give you really fluffy potatoes with no bits. Add the parmesan, egg yolks, salt and half the flour. Knead with your hands, adding more flour as you need. You want the dough to be smooth, moist but not sticky. If the dough sticks to your hands, add more flour. It should be very soft and bounce back slightly when pushed. Divide the dough into 4 pieces, then roll out each one like a long skinny sausage, and cut 2cm to 1 inch pieces. 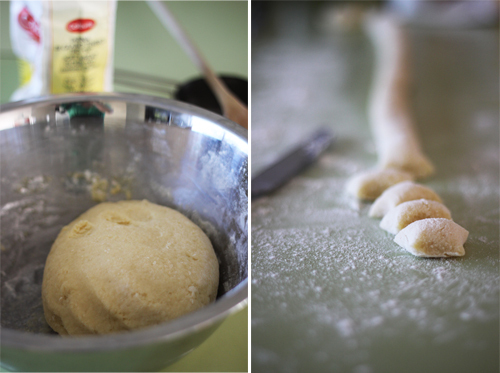 Set aside on paper towels (it’s best to cook this straight away, fresh homemade gnocchi does not last in the fridge). Bring a large pot of salted water to the boil, gently drop the gnocchi in and let them cook for a couple of minutes. When they rise to the surface, test on by tasting. They cook really quickly – don’t leave it too long otherwise they will overcook. Remove with a slotted spoon. 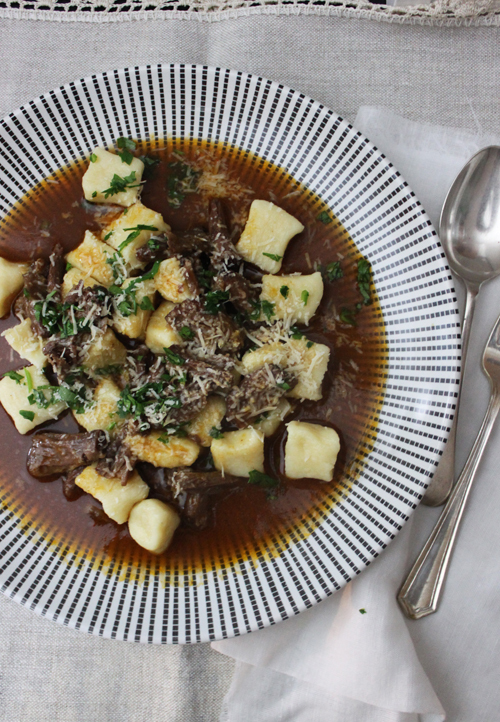 Place the gnocchi in a bowl and top with the hot braised ox tail. Top with grated cheese and parsley. Oh. My. Foodness. This looks so inviting. Gorgeous photos. Fashion worthy! OMG!!!!!! AMAZING FOOD!!! I WANT TO EAT!